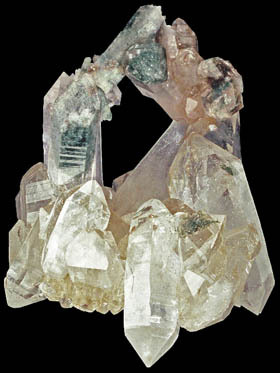 Quartz with Chlorite incl. from the Kulu Valley in India. We offer fine worldwide minerals for discerning collectors at reasonable prices. Our site is searchable according to your mineral name, locality, price, etc. The searchable fields are on this page, down below the recent updates. We offer quantity discounts on our mineral specimens up to 20%, click on the "quantity discounts" page to find out the details. I scrolling down below to the serach fields and clicking on "available," to view the 62 pieces we still hae for sale on the web site. Many of these I would have sold instantly at shows had I brought them! I recently marked down others like Acanthites and olmiites, to less than half of the original prices. See us next at the 2019 Greater Cincinnati Gem, Mineral and Fossil show at the Sharonville convention center. it’s Saturday and Sunday, May 4th and 5th. Mineral show schedule. We will be bringing lots of new minerals: interpenetrating pyrite cubes from Spain, green fluorite from Madagascar, Rubies from India, and Madagascar, crystallized gold from California, bright green, Chrome Petrified wood (180 million year old petrified Woodworthia from Winslow Arizona), Emeralds from Colombia, and brazil, new Herkimer diamonds, Arkansas Quartz clusters, Black tourmaline spheres, hundreds of new thumbnails, purple grape amethyst recenty found in the deposits in Mamuju, Indonesia, and many, many more! Who buys rock collections? We do. Who buys tourmaline and fluorite? We do. Are you a mineral collector? Do you collect gem crystals? We sell gem crystals online and at over 12 mineral shows each year.